Preheat your oven to 450ºF and then heat some grapeseed oil in an oven proof skillet on a high heat. Dry the Sea Bass thoroughly and season with salt and pepper. Sear the fillets for about 3 minutes on each side, turning once, until you get a crispy golden crust on each side. Transfer the pan to the hot oven, roasting the Sea Bass for about 5 minutes until it is just cooked through. Plate the fish, drizzle with sauce and sprinkle with fresh dill. Ever have perfect Chilean sea bass in a restaurant, with a crispy crust and buttery smooth insides? Maybe a light sauce draping the filet? You would be amazed that this fish is one of the easiest ways to cook fish at home. It is essentially prepared the same way I make my Bacon-wrapped filet mignon or my Rack of lamb. You sear it in a hot pan on the stove and finish it in the oven. It all comes together, including the sauce, in under half an hour. 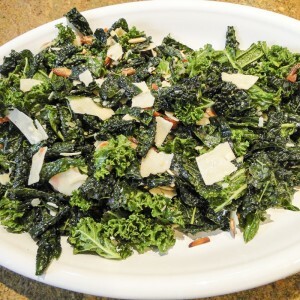 This recipe is a modified version of a recipe published by Straubs grocery store. Once you have the pan-searing, oven-finishing technique down for cooking thick-cut fish, you can experiment with different fish and a variety of sauces. Try using this technique for preparing halibut. Make a white wine, mushrooms, butter and parsley sauce. 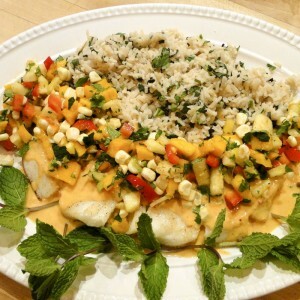 Or top the fish with my Tropical fruit salsa. 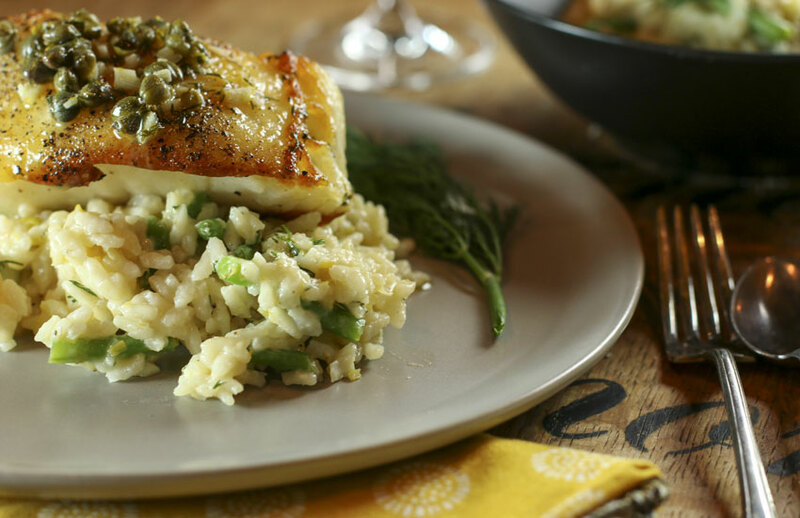 I like to serve this Chilean sea bass with my Green bean and dill risotto. 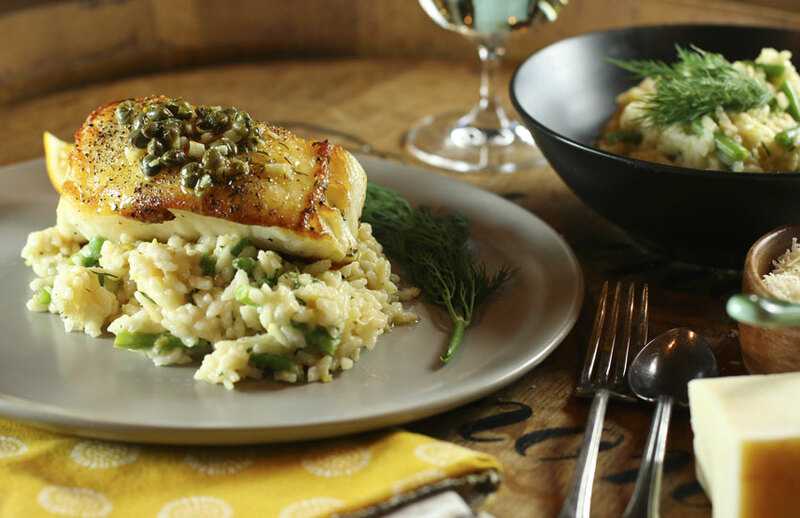 Known as the filet mignon of fish, Chilean sea bass is a buttery, melt-in-your-mouth fish. Chilean sea bass is actually not a member of the bass family. It is actually a Patagonian toothfish. It is a slow-growing fish that lives about 40 years. Is Chilean sea bass sustainable? Because Chilean sea bass is so darned delicious it was seriously overfished, often using methods that resulted in a lot of by-catch with lots of pirate fishing by unscrupulous fishermen. Due to pressure from governments, conservation groups and industry, these practices have improved dramatically, although not uniformly all over the world. 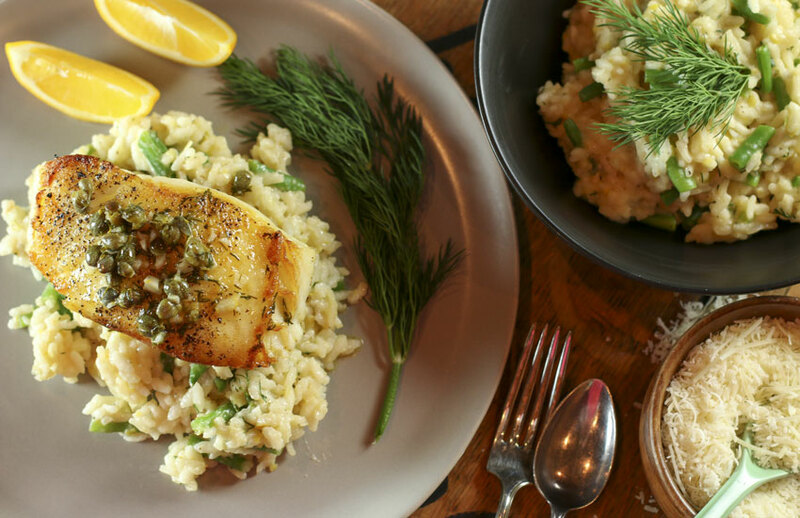 The result is Monterey Bay Aquarium's Seafood Watch provides mixed sustainability recommendations for Chilean sea bass, including Best Choice, Good Choice and Avoid for Chilean sea bass, depending where it was caught and how it was caught. Other environmental groups say Chilean sea bass should not be elevated in its sustainability rating until there are more uniform world-wide fishing practices and more accurate labeling. Chilean sea bass is a larger, slow-growing fish and consequently does accumulate mercury. Chilean sea bass is listed by the Environmental Defense Fund as being high in mercury, although not as high as swordfish or shark. The EDF provides safe eating recommendations of no more than two servings per month for adults and one serving per month for children. A recent study by the University of Hawaii-Manoa found that levels of mercury depend on where the fish is caught and that current labeling practices cannot always be relied on to accurately track where the fish was sourced. Sea bass from near the Antarctic where pollution levels are lower were found to have significantly lower levels of mercury than sea bass caught farther north. The sustainability and environmentally sound fishing practices for Chilean sea bass have improved significantly in recent years, but there is more work to be done. Mercury levels are more concerning, as our oceans are not getting any cleaner. As long as labeling of fish is inaccurate, we will not really know what we are eating. As much as I really love Chilean sea bass, I will save it for special occasions and focus my fish consumption on more environmentally sustainable, lower mercury, high omega-3 species. Heat your oven to 450 degrees. Put wine, garlic, shallot, lemon juice and lemon zest in a small saucepan and bring to a boil. Continue cooking until liquid is reduced to about 1/3 cup. Reduce heat to low and whisk in 1 tablespoon of butter at a time. Remove from heat and stir in 1 T dill and capers. Season with salt and pepper and set aside. Heat an oven proof skillet on high and add grapeseed oil to the pan. Heat the oil until it starts to shimmer. Dry the sea bass thoroughly and season with salt and pepper. Sear the fillets for about 3 minutes on each side, turning once. The goal is to get a crispy golden crust on each side. Remove the pan from the stove and transfer to the hot oven. Roast for about 5 minutes in the oven until sea bass is just cooked through. 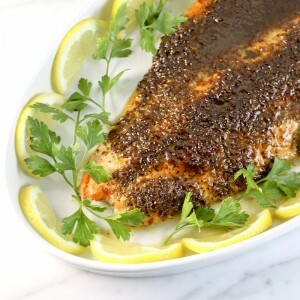 Plate the fish, drizzle with sauce and sprinkle with remaining 1 T fresh dill. I made this last night with the risotto and it was delicious! The fish was so easy to prepare. So glad you liked it Kim! This recipe is nothing short of fabulous! I made this with the risotto and it was amazing. Thank you for sharing! Ashly I am so happy you enjoyed this recipe. You made my day! So glad you enjoyed this recipe Garnette! Hi Sharon — I use grapeseed oil because of its high smoke point. The goal is to sear the fish in a really hot pan and butter tends to burn. I use butter in the sauce for flavor. Hi Jenny, in general “t” refers to teaspoon and “T” refers to tablespoon. I’m a lemon lover and like a strong lemon flavor, but you can adjust to your own preference by reducing the amount of lemon juice. It also depends on what kind of lemons you are using. Some are more sour than others. Next time you might try the recipe with Meyer lemons, which are sweeter than regular lemons. Any tips for searing the Chilean Sea Bass? My did stick a little and sort of spread apart. It was hard to manipulate. It was all one piece so next time will cut up the portions first. Maybe that will help. Other than that, it was sooo delicious! Hi Elaine, there are a couple tricks to keep fish from sticking when you sear it. 1) Bring the fish to room temperature before you put it in the pan, 2) Thoroughly dry the fish off before you season it, 3) Season right before you sear, 4) Choose an appropriate pan. A well-seasoned cast iron, carbon steel or stainless steel pan work best because they handle high temperatures well. I usually use my Le Creuset frying pan. While logically you may think a non-stick pan would be best to avoid sticking, in general, non-stick pans are not meant to be used with the high heat needed to properly sear fish. HIgh heat ruins their finish. 5) Start with high heat and heat the pan until it is very hot, 6) Add an oil with a high smoke point, such as grape seed oil, 7) Get the oil very hot. It should be shimmering, but not smoking, before you add the fish. 8) Add your fish to the pan and after a few seconds press down on the fish with your spatula so that the entire fillet comes into contact with the pan, 9) Now leave the fish alone and turn down the heat to medium. Don’t play with the fish or try and flip it too early. The fish will release naturally when it is ready. Test for release by shaking the pan to see if it moves, and not by doing a trial flip. I hope this helps! I made this for a dinner party and it was fabulous. My guests raved about it. I did use two different pans to sear the fish and the pan that was non-stick did not brown the fish as well as the pan that was not. This is going on my “favorites” list. Thanks for your comment Judy. I agree, non-stick pans are best for searing. Cast iron and stainless steel work best, you just have to be patient and let the fish release on its own. The one exception for me are Scan Pans. I have had good luck searing with these non-stick ceramic pans from Denmark. Absolutely wonderful! I did not have grape seed oil so I tried coconut oil and there were no negatives. Sauce is delicious. I made this sea bass, along with the recommended risotto and kale salad, and it was FABULOUS! My whole foodie crowd raved about it. Hi Erin, Thank you for writing in. I’m so glad you and your friends enjoyed the recipes. This Chilean Sea Bass is a personal favorite and is fast becoming one of our most popular recipes. Hi – I am making tonight. I can’t wait. How many servings would you say this is? I will post my comments after I cook it. Thanks! Hi Carlita, this recipe serves four. I allow half a pound of fish per person. I hope you enjoy your meal! My dinner turned out fantastic. Highly recommend this recipe. 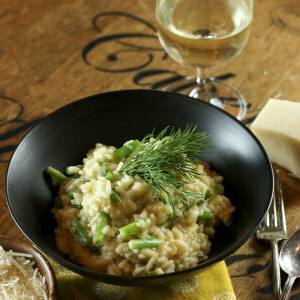 I made with the green bean risotto. Super yum! Hi Carlita, Thanks for writing in. I am so glad your meal worked out well for you. This is always my problem – the fish sticks to the pan! I used a ton of oil in a cast iron pan on med high. What am I doing wrong? Hi Linda, This is a common problem so don’t get discouraged. Get the pan very hot before you add the oil. Then get the oil very hot, to the point where it begins to shimmer, before you add the fish. Then resist the temptation to try and turn the fish too early. When the fish is seared it releases naturally. If you try and flip it and encounter resistance, back off and let it cook a bit more before trying again. Good luck and don’t give up! Amazing! I wanted to lick the sauce right out of the pan. This was my first time cooking Sea Bass and now the bar is set high. Thank you, Kim! Meghan, I am so glad you liked the recipe! Beautiful recipe. Fish was perfectly cooked (which was important for $15×2 fillets from whole foods! ), and sauce was delicious. Made it with a fennel/tomato side. It was like a very nice restaurant entree 🙂 Wife loved it. Thank you!! This is one of my most popular recipes. I am so glad you enjoyed it. And yes, your are right. Chilean Sea Bass is crazy expensive, so it has to come out perfect! Wonderful recipe! I had a great 2 lb cut of the Chilean Sea Bass, fried in an old Wagner Cast Iron Skillet – and used the leftovers for fish tacos. Sauteed the leftover Bass in a little butter, Cumin Powder, Garlic Powder, and Chipotle Chile Powder. Not enough to over power the Bass….just give it an extraordinary flavor. Served it in gently fried corn tortillas with shredded cabbage and a Sriracha Mayo Sauce. Both meals were winners! can i use halibut fish? Yes you can use halibut or any thick cut fish for this recipe Patty. I do find halibut a little more delicate. 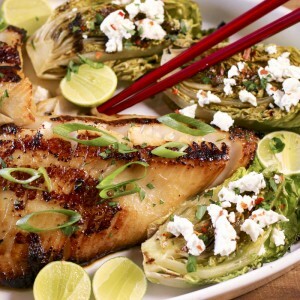 If you are new to this method of cooking fish I would recommend trying sea bass first. This recipe sounds amazing. Can you tell me the best approach to make this recipe for a dinner party of 12? I’m concerned that searing 6 pounds of fish would not work out so well. I was thinking of baking in the oven in casserole dish’s. Any advise would certainly be appreciated. Hi Missy, the sear is what achieves the great crust on the fish. The searing takes just a couple minutes so I would not skip this step. Either do it in batches or use two large pans. Don’t overcrowd as that will result in steamed and not seared fish. Once the fish is seared, the oven will finish the fish for you. I’d advise gathering your guests in the kitchen and opening a bottle of wine while you sear. If you are making the green bean risotto to go with it, put someone in charge of stirring the rice while you sear the fish. Alternatively, I have read that you can sear the fish in advance, refrigerate it and then finish it in the oven when you are ready to serve. I personally have not tried this, although I have done this with steak. It should work. I’ll put it to the test in the near future and report back to you. Let me know if you try it first. Good luck! Have a wonderful dinner party. Holy wow. This was awesome! So glad you liked it Christy! Incredible directions. I was afrai d I would ruin Chilean sea bass but you led me to a perfect meal . Hi Judy, I am so glad the recipe worked out for you. 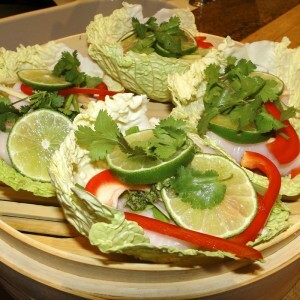 This is one of SNFD most popular recipes. I know exactly what you mean. When you are working with an expensive cut of meat or an expensive fish like Chilean Sea Bass, there is always a little trepidation when you try a new method of cooking it. Thank you for writing in! I have a way to deal with the sticking problem: I keep the skin on the fish, and don’t put any seasoning on the skin. Sear the fish with the skin down for three to five minutes, and finish it off in the oven. When it is ready to serve, use a spatula to peel the meat off the skin gently. The meat should come off nicely as one complete filet, perfectly browned. Thank you Hans! A good tip. Another way is to get your pan very hot before you add oil, and again very hot before you add the fish. Then avoid forcing the fish, as it cooks the fish will release from the pan if you don’t try to flip it too early. This way you can also enjoy the crispy skin. I made your recipe tonight and my husband said it was fabulous! I served it with polenta and asparagus. I will definitely make this again and again. Thank you for the great recipe. I’m so glad you enjoyed this recipe. Your entire meal sounds delicious. I like serving the sea bass with polenta. Not your everyday pairing, but I think it would be delicious together. 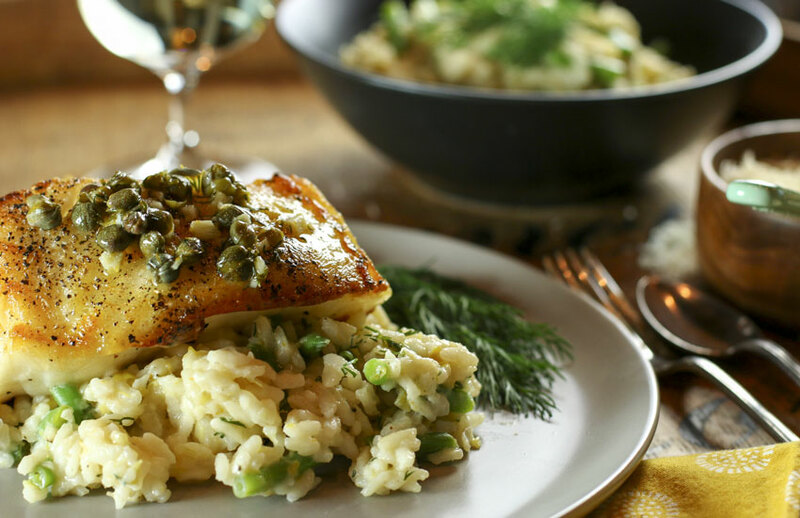 I made your Chilean Sea Bass with lemon, dill & caper sauce. My hubby said it was the best fish he has ever eaten. I had to agree. The fish was flaky and the sauce devine. Making it again tonight with asparagus on the side. Yum! Wow! I just cooked this, with your recommended risotto, for my husband. We both loved it! I have never cooked fish or risotto before. Thank you! Your recipe was perfect and helped me achieve it without any issue. I was unsure if the sauce was necessary with the fish as I was doing the risotto with it, I made it any way. I was so wrong. It added so much flavour and gave it a sharper freshness which was needed. Thank you again. Hi Sam, I am so glad you enjoyed this recipe. Here are some additional fish recipes you may enjoy: Super Easy Fish and Veggie Gratin, Swordfish, Mushrooms, Lemon and Capers and Grilled Branzino with Lime and Herbs. If you really want to try something out-of-the-box, check out my new recipe for Grilled Octopus! Kim I am so glad I stumbled onto your website and found your Chilean Seabass recipe. I love this fish but felt I never really had a good recipe for it like I do with my other favorites Salmon, Swordfush and Walleye. So till now I’ve really only enjoyed Seabass at nice restaurants and now I can enjoy it at home with your wonderfuly delicious recipe. – so thank you! Just one question thecapital ‘T’s are Tablespoons correct? When I made this I had a small left over piece of fish in my Freezer about 6 oz so I reduced everything but I plan to make this again for the family with the 2 lbs and want to be sure I have it 100% correct. Hi Paul, I am so glad you are enjoying my Chilean Sea Bass recipe. It is one of the my readers’ most favorite recipes. Yes capital “T” is short for tablespoons and lowercase “t”is short for teaspoons. That said, I encourage you to always taste your cooking and not get too hung up on measurements (unless you are baking). Use my measurements as a starting point and then let your taste buds be the final boss. Please write back and tell us how the recipe worked for you. I’m making it tonight too for a romantic home-cooked meal. This is the first time on here since you changed your format. I have to tell you….I Love It! I will have to change the fish because we can’t get it here in Canada where I live. Do you have any suggestions for cold water fish? 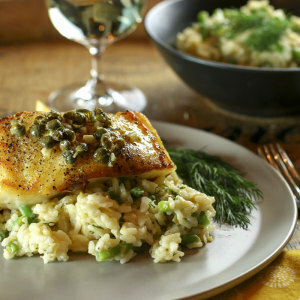 Hi Charlie, if you can’t get Chilean Sea Bass try the recipe with a thick halibut fillet. It will be delicious! I made this recipe a couple of weeks ago and it was really great! The fish looked and tasted like something a professional chef made!! I am trying tonight with halibut, which I think will work well too! Chilean Sea Bass is really expensive where I live, as is halibut. 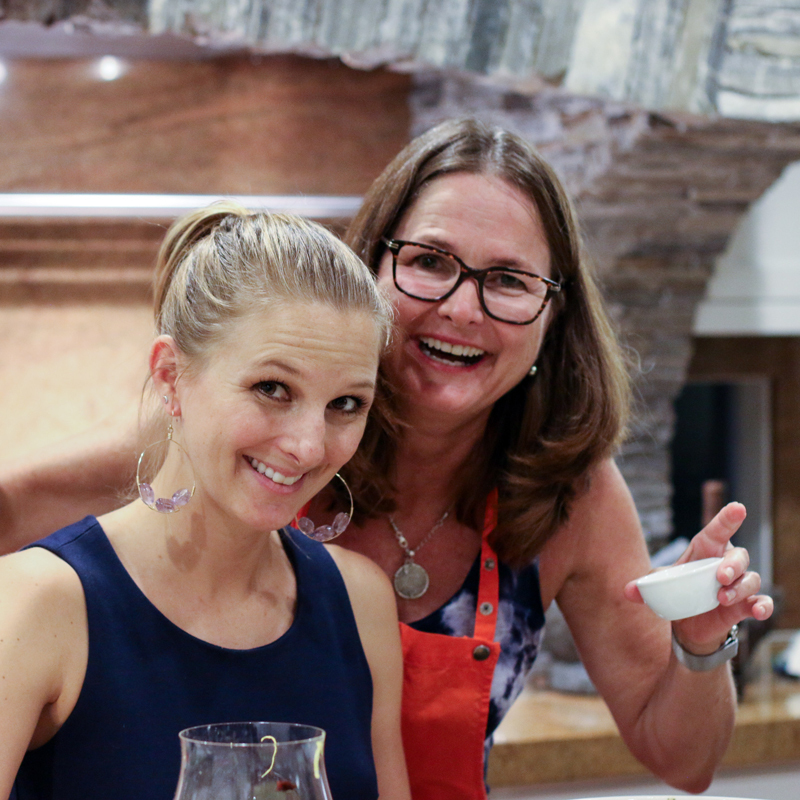 So, having a recipe that taste so great and is easy to make is important! Hi Xhana, I’m so glad you enjoyed the recipe. I agree 100%, Chilean Sea Bass is crazy expensive, so not something we can enjoy every day. The basic technique will work with most thick fish fillets. You essentially sear on the stove and finish in the oven. It also works with chicken, steak and lamb. Check out my post The Easiest, Most Reliable Way to Cook Chicken, Steak, Rack of Lamb and Fish. Knowing this technique will give you lots of options in the kitchen. I made this dish for my wife and I last week it it was perhaps the best fish dish I’ve ever made. I had to sub in a combination of vegan butter and extra virgin olive oil in place of the butter to avoid a dairy allergy but the sauce was still incredible. Also, Whole Foods sells single frozen filets of wild sea bass for a more reasonable price. Now the wife is testing to be pregnant, it could all be because this sea bass was so good! Wow Matt! This is perhaps the best review I have ever received. My fingers crossed on the pregnancy test. Wishing you and your wife all the best. I’d love to know what mixture of olive oil and type of vegan butter you used. I’m sure many of our readers would also appreciate it. Good luck!